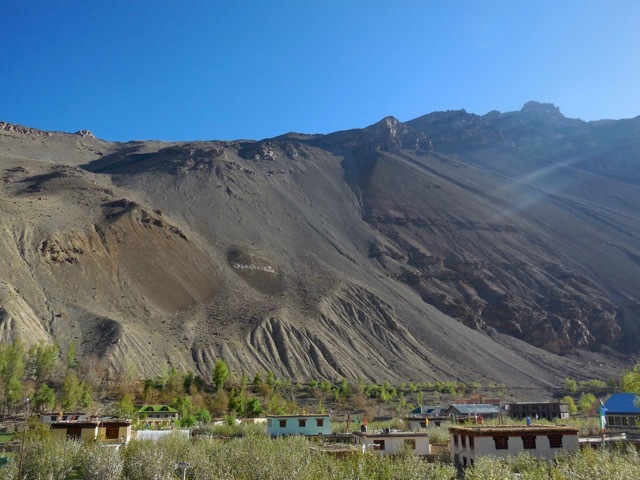 Himachal - Kalpa, Nako, Tabo, Dhankar - Ghumakkar - Inspiring travel experiences. 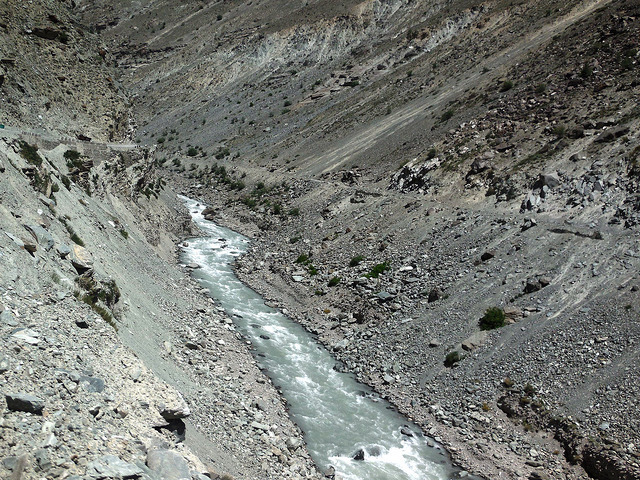 After that we ascended further to Kalpa which is just 8 km but one has to gain lot of height. 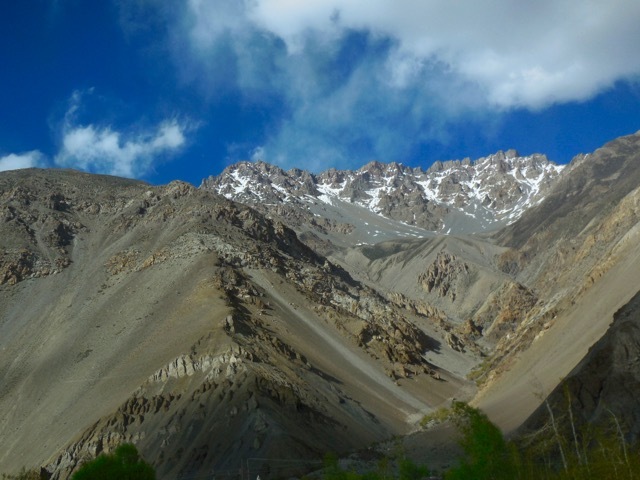 As we ascended through winding roads and wooded forest, Kinnaur Kailash range was getting visible and direction of sun was favorable. 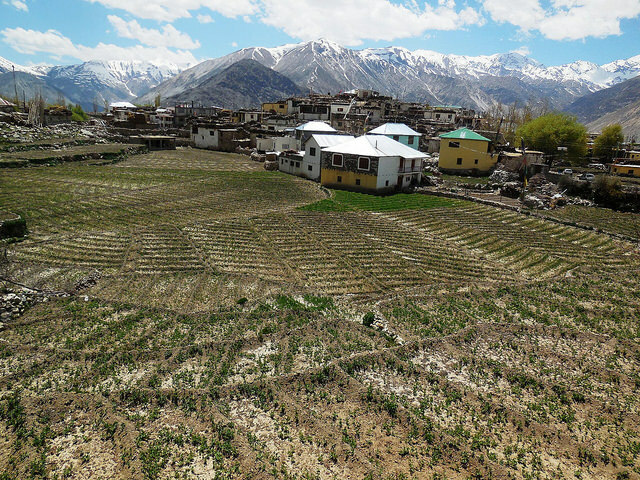 We checked into hotel Apple Pie which like rest of the hotels had rooms facing the Kinnaur Kailash. 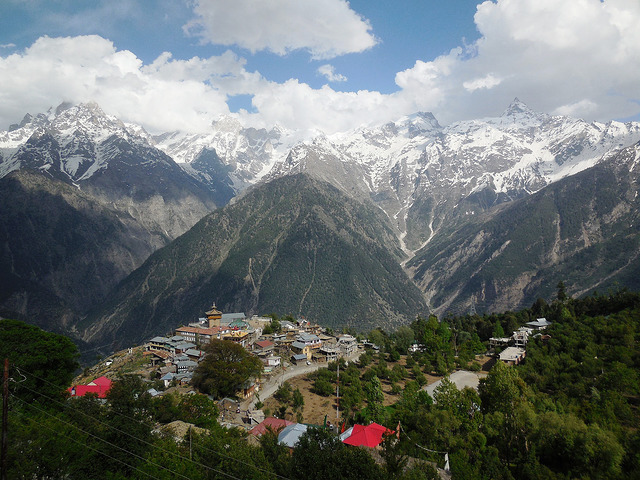 The main town of Kalpa was visible a little below with its distinct temple. Since we didn’t have any plans for afternoon we were invariably looking at them trying to take in as much as we can, every peak, crevice, the tree line. I borrowed binoculars from the hotel manager repeated the routine again and again every time looking at something new resting only to take a deep breath of the cool air. Towards the evening dark clouds gathered on the range and probably it rained. 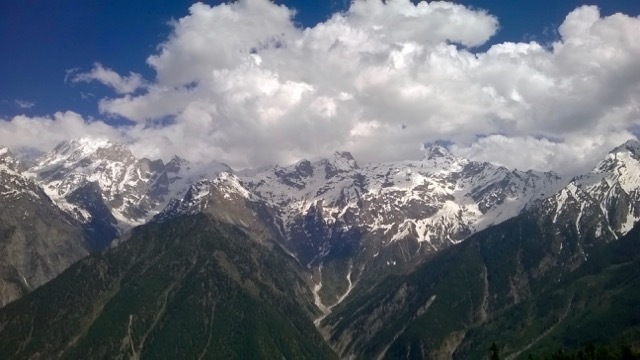 The Kinnaur Kailash range has a peak which has a shivling stone on top. 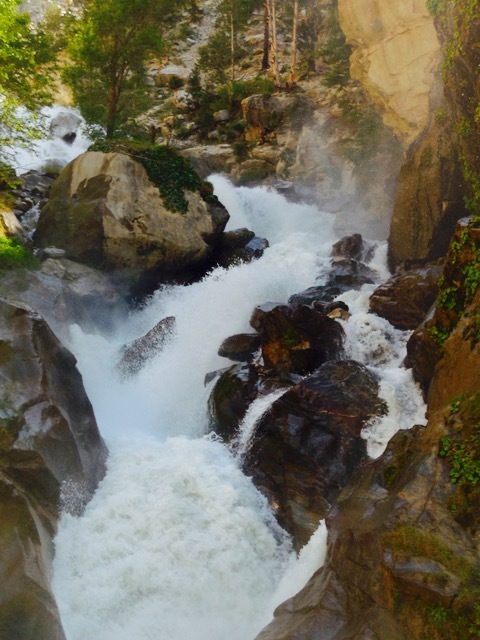 There is a well know trek to shivling peak. 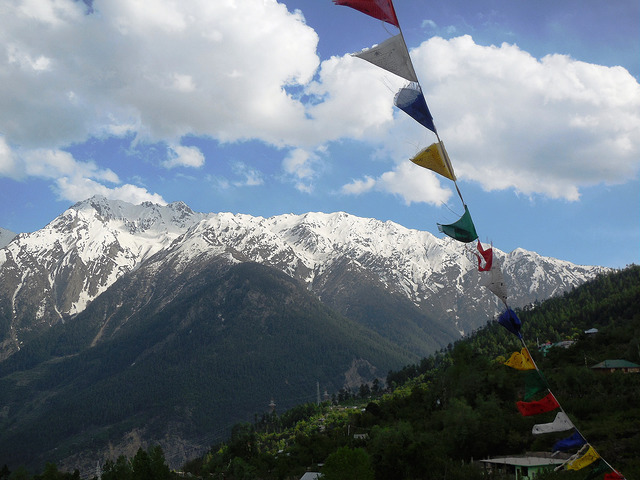 One which goes around the peak called “Parikrama” and other one is to get down to the other side at Chitkul. 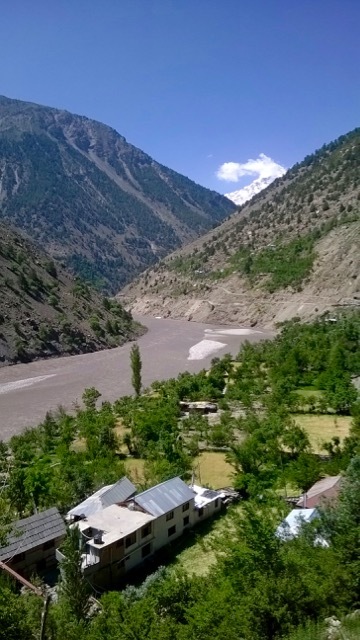 The Sangla valley from where we came is just beyond the Kinnaur Kailash range. 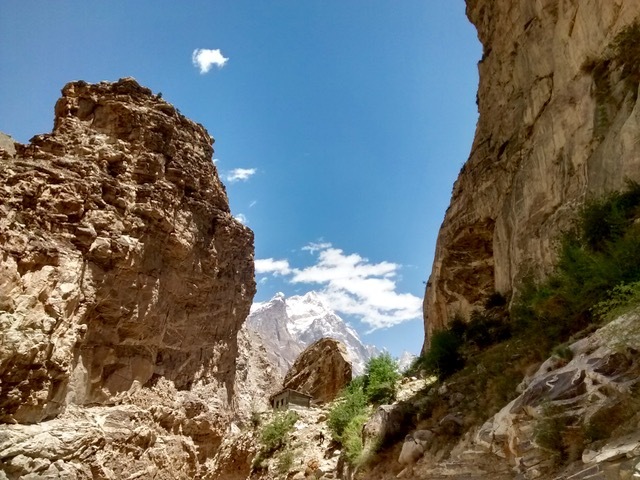 We started early from Kalpa at 6:30 am to be able to reach Tabo before sunset. 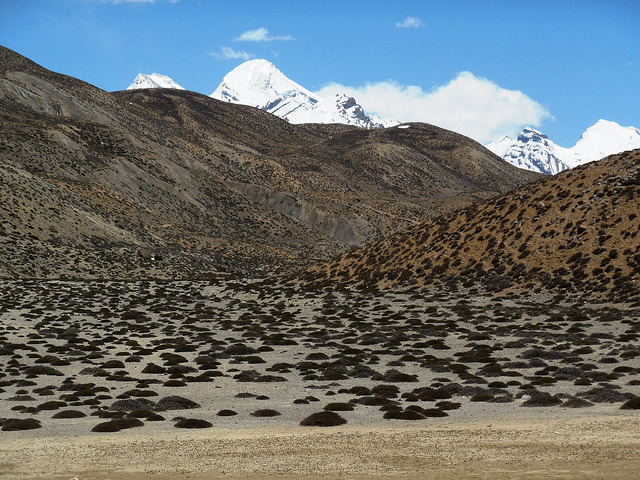 We drove down to Reckong Peo and further to Powari to join the main Hindustan-Tibet highway. Just after Powari we had a puncture. Thankfully, we had spare tyre so it was rectified quickly. The road was really bad from here upto Spillo and even though BRO does a great job but the water, mud/gravel, landslide really play a havoc with road. 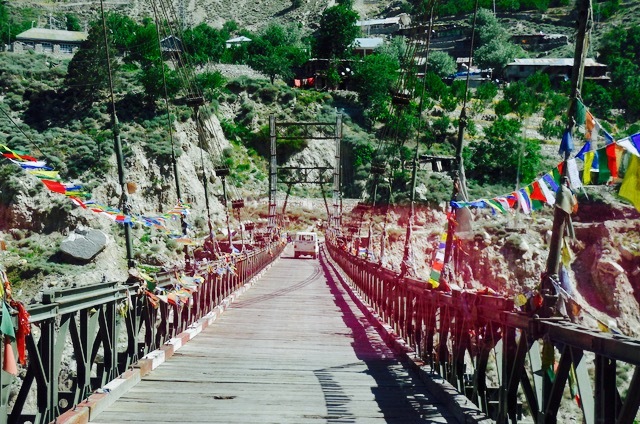 We crossed over from left bank of Sutlej to right bank at Akpa over a wooden bridge adorned with prayer flag. Here there is a check post as well of Himachal police. We halted a little further at Spillo. From here on the vegetation was all gone except small patches around cluster of houses. 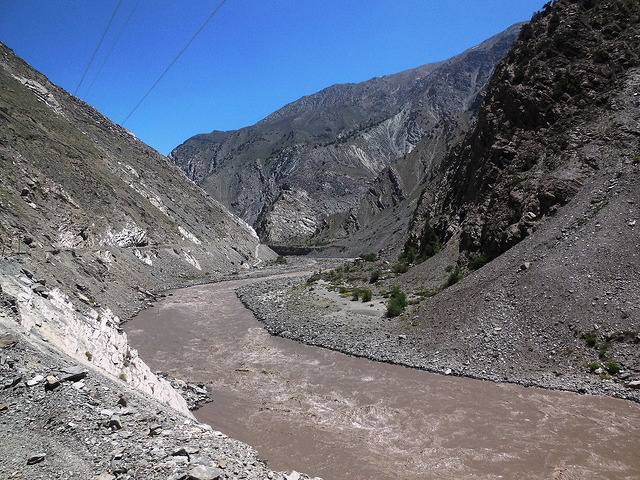 We are in Sutlej river valley and it was all muddy brown in color. 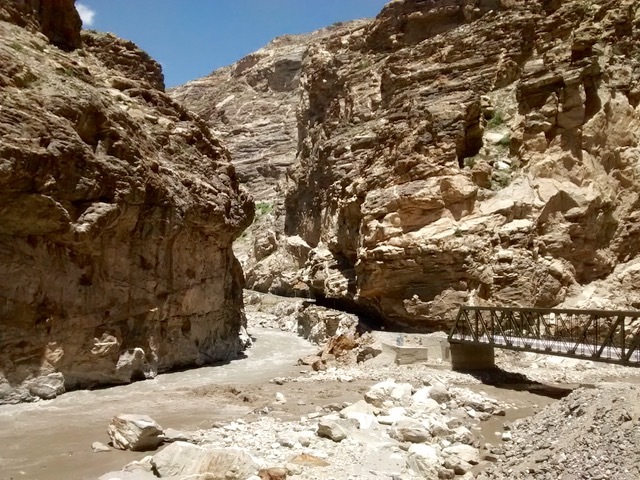 For very short distance we veer towards a tributary of Sutlej to cross over which was much cleaner in color probably it was flowing through hard rock. 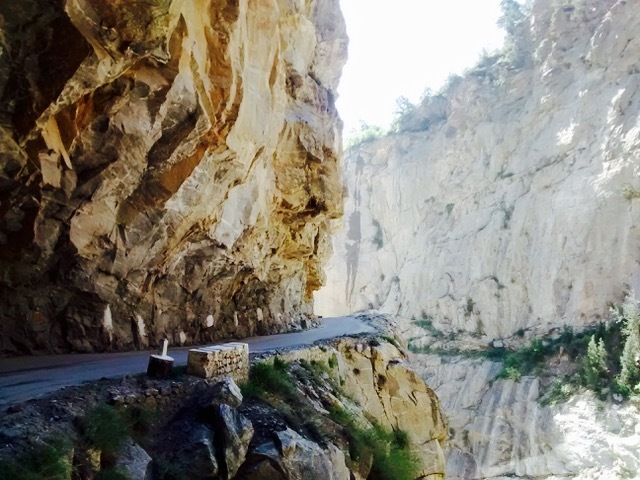 After that it was dusty road all the way till Pooh which is an important center of Kinnaur district. It is wiser to come in an AC vehicle to keep away the dust. 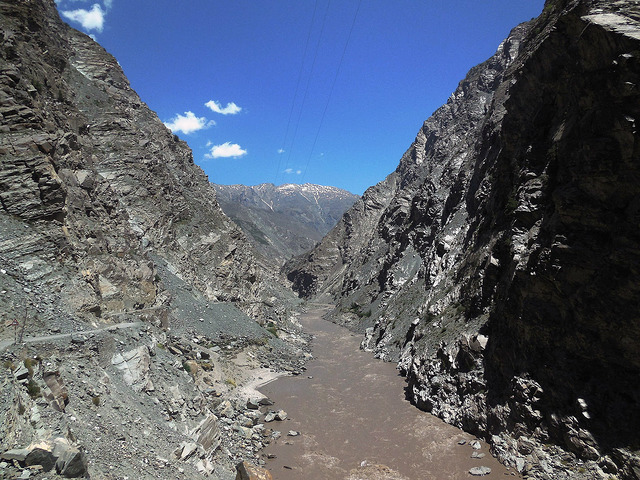 We next stopped near Khab where Sutlej river coming from Shikpila pass towards the east meets Spiti river from north. 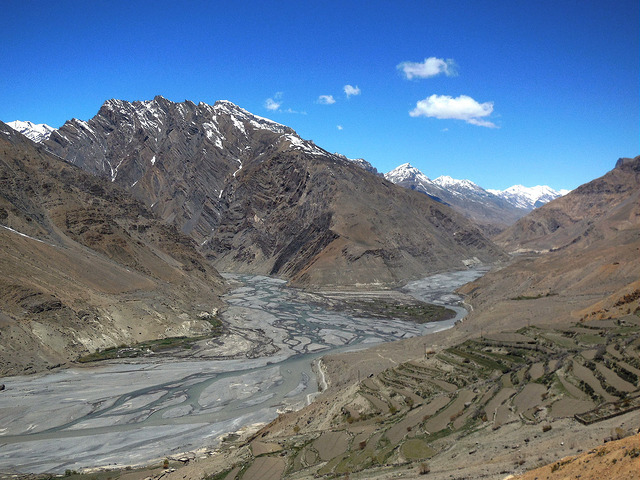 Spiti has much cleaner water and it can be seen distinctly at the confluence. Shipkila which is a pass to Tibet/China is only around 40 km from here. 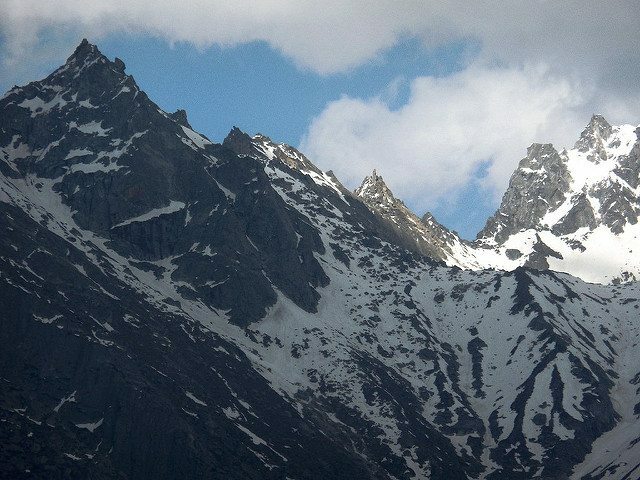 One of the high peaks of Kinnaur district Reo Purgyil (6800+ mts) is also situated here. Out next stop for lunch was Nako. 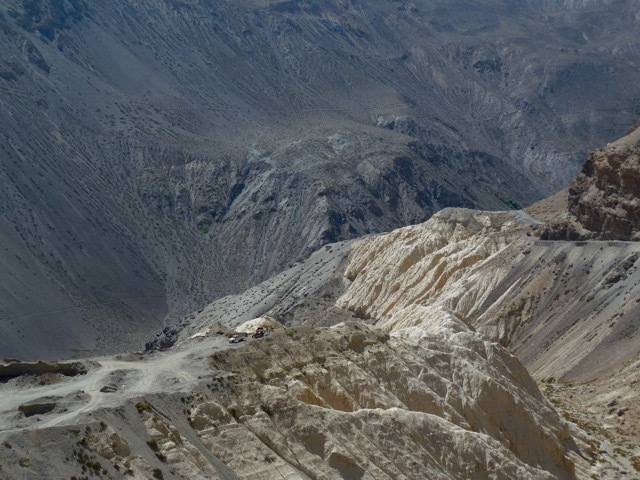 The road climbs over precarious mountain slope over many loops to Nako. It is one of high points of the road. We were keeping ourselves hydrated for the height. I did feel a little dizzy at this height. 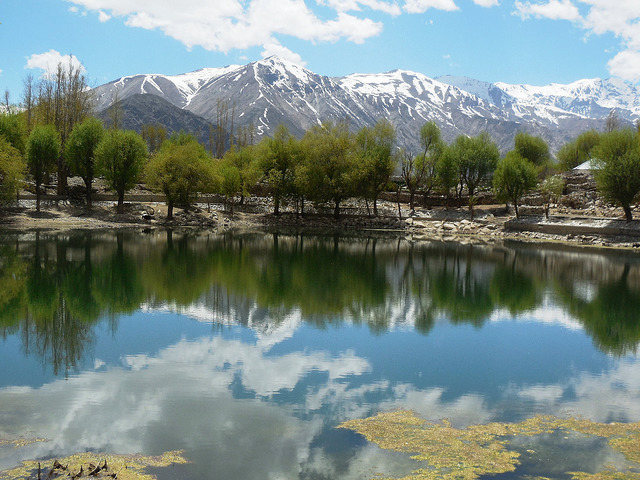 Nako is small town with houses, few hotels and a lake. We went around the lake and admired the reflection of surrounding peaks and some vegetation. The villagers had sown peas in some of the patches near lake. 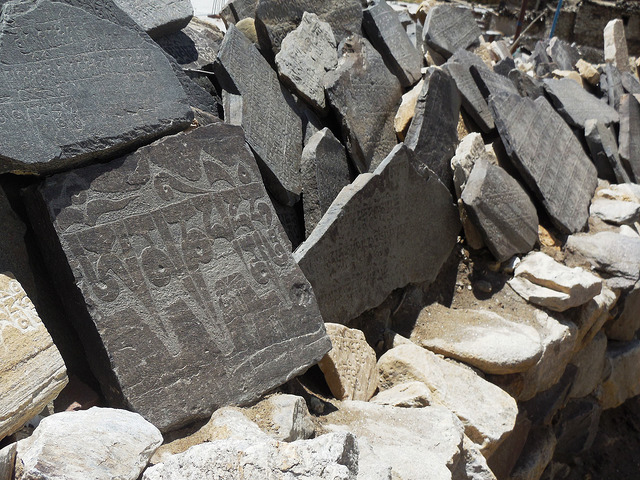 There were lot of stone slabs scattered around with buddhist prayers and symbols etched in them. 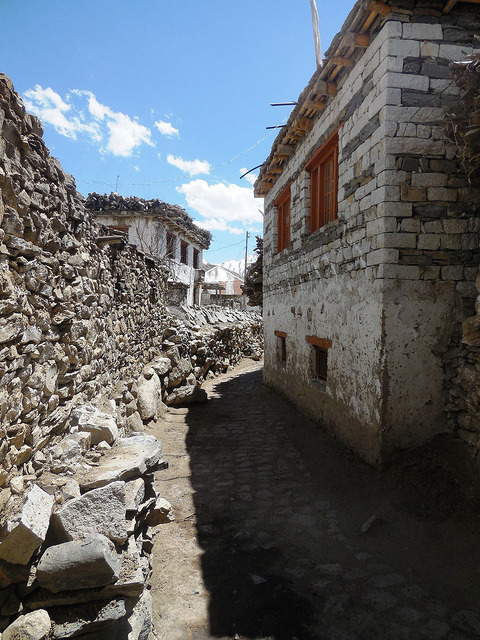 Our guide showed couple of shrines in the village and took us through its alleys. We had our lunch at one of the hotels here. Our last stop for the day was mummy at Giu village. The mummy is hundreds of year old body of a lama which did not decompose and was unearthed during some road construction. The local people rever and pray to it. Over the years it seem to grow some hair near forehead. Earlier mummy was kept at village but now a proper concrete temple is being built high above the village. The key of the temple is kept in the village and some volunteer accompanies us to the temple and open it. 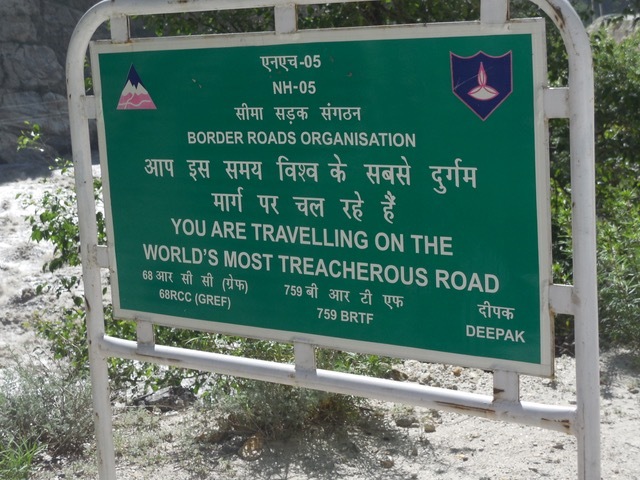 This place is very close to Tibet/China border. 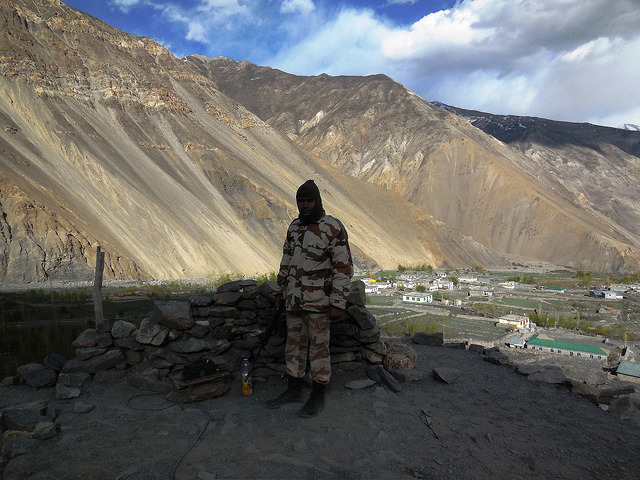 There was a lone ITBP gunman with old telephone equipment posted here to keep a watch with makeshift bunker. There is a small company of ITBP at the village for backup. 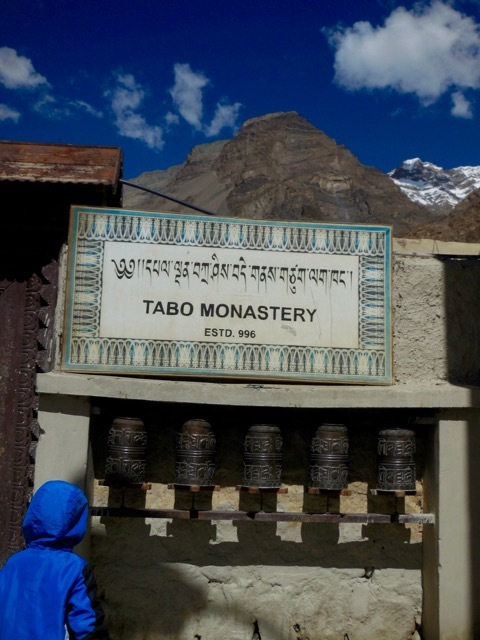 We reached Tabo which is a town in open valley famous for its monastery. We checked into Tiger Den hotel. I took a stroll around the place. There is a helipad where a local cricket match was going on. The place is quite windy due to the geography of hills around. The hotel room was basic and clean. The dining area was completely in traditional Buddhist style with seating on carpeted floor and food on the wooden table. The hot food in such a setting irrespectively tastes good. After the dinner I climbed to terrace to look at star-studded sky in windy night. 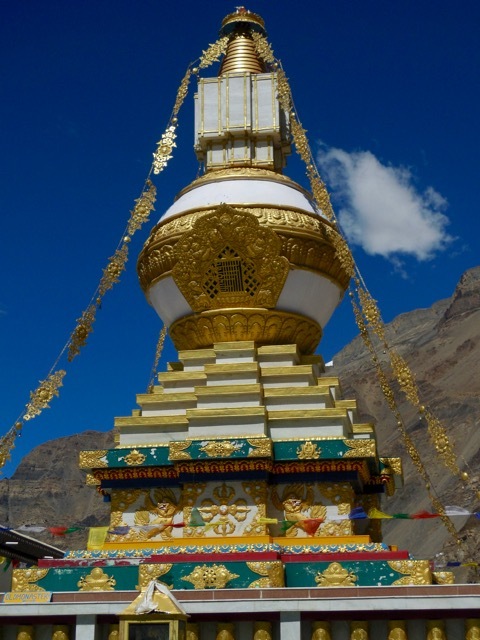 Next day we visited Tabo monastery. The old monastery is completely made of mud and built in 10th century and still going strong. There were lot of deities, paintings, figures inside which our guide painstakingly explained. 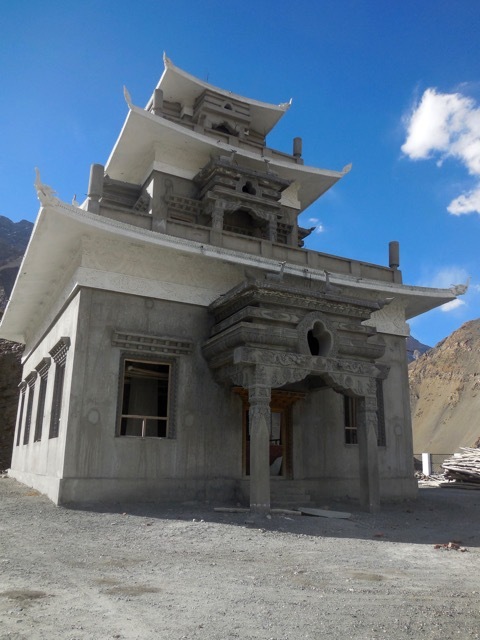 There is a new grand monastery being built in the town which will be commissioned soon. We started from Tabo and went to Dhankar. 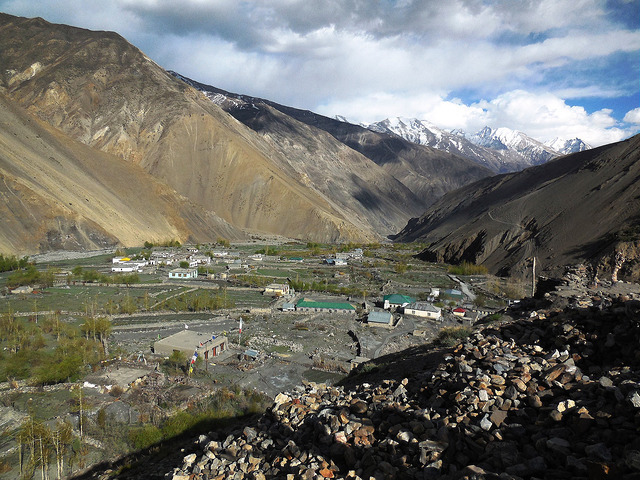 Its a village perched high above from the road to Kaza. It has a monastery which is second only to Tabo in reputation in the region. 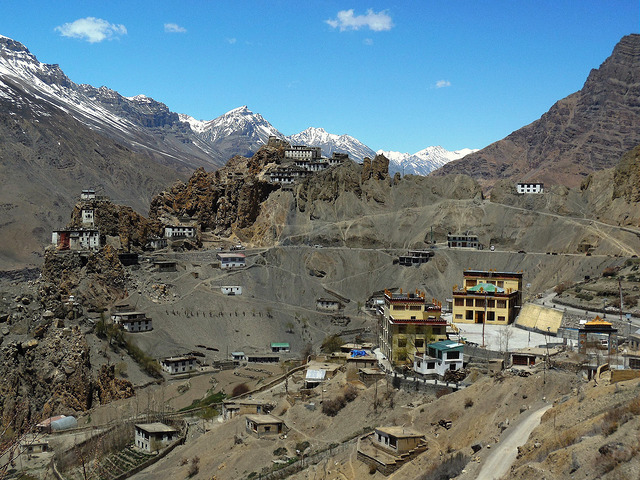 The monastery is precariously placed on the edge of mountain overlooking the huge delta of Spiti merging with Pin river. The monastery was closed as the main priest was away though we were feasting on the views. 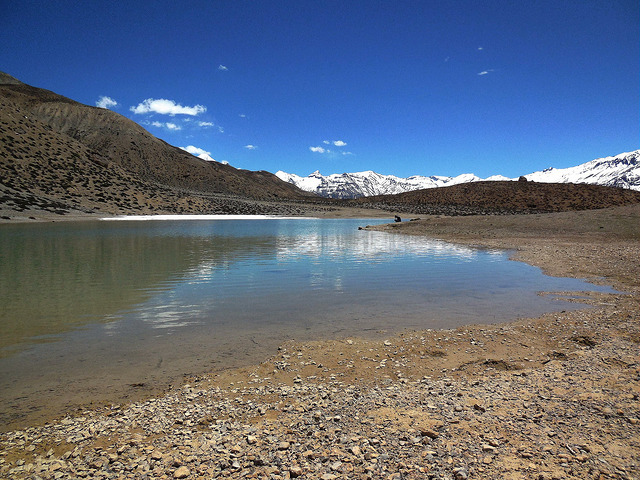 Dhankar also has a high-altitude lake which is at the height of 4200 mts around an hour and half of steep trek away. We were all prepared to do the climb but my son being only 4 years was doubtful. Even though we all started but after some time due to tiredness wife & son held back. Me & the guide trekked along. After around an hour we reached the top of a plateau from where lake is a little further. The path is all strewn with a distinct vegetation strewn around the landscape. The lake was really breath-taking. The water was transparent and there were fish in the water! I just tried to soak in as much as possible of the lake view. 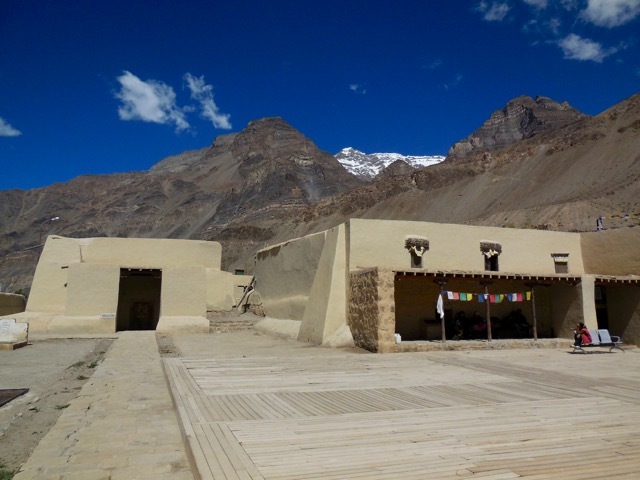 After we came down to Dhankar we had food at a guest house there. They made us a Tibetan Sandwich which was omlette and other veggies stuffed between Tibetan bread. 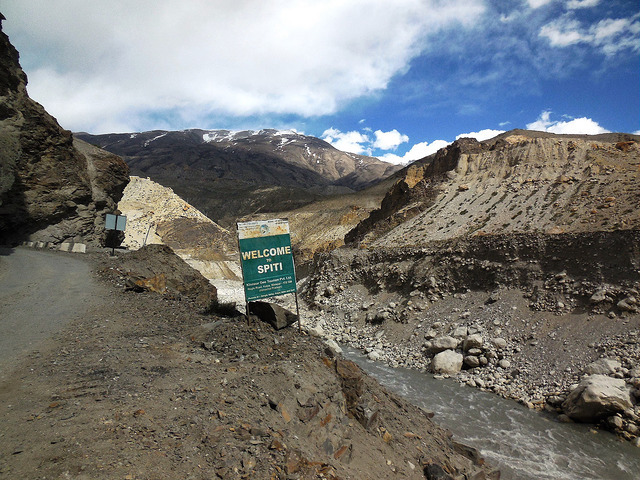 After that we went came to Kaza and checked into hotel Spiti Valley. 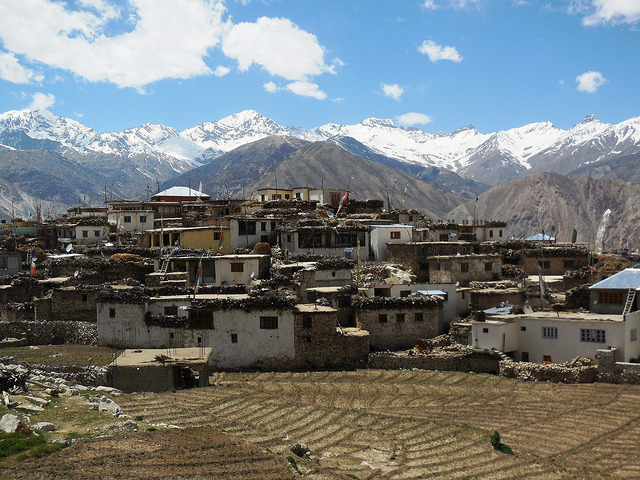 After settling down we went for a little stroll at Kaza market which is the main town center of Spiti valley. A great journey. 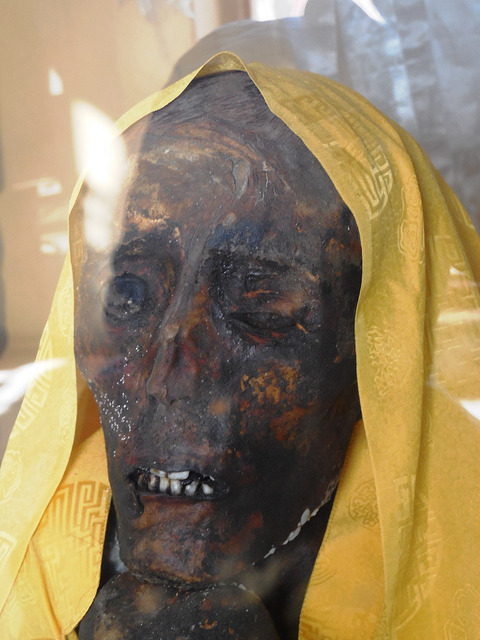 The detailed account of the Giu mummy was real good. I had heard about it. You made it possible to see its picture. And regarding pictures… all are wonderful, colourful, clear and awesome. I have a question , would a small car like beat make this trip? I dont want to take my honda city as I think its too big for thin roads . I think more than the car its the skill of driving in such road matters. Certainly a small car like Beat with light load is better but ground clearance could be an issue. Nice write up with each and every small detailed elaborated with beautiful pictures. The place is heavenly and your pictures just make it even more. 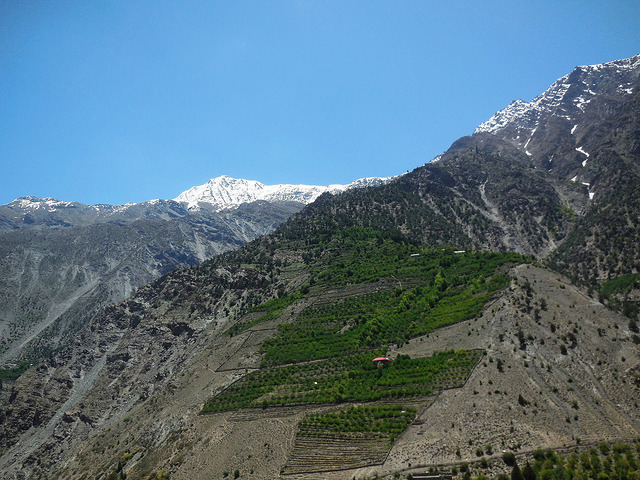 Did you stay at Apple Pie at Kalpa or Sangla or may be both ? Thanks. Yes we stayed at Apple Pie at both the places. Instead of Sangla it was in Rakchham. Very beautiful writeup and pictures! Thank you. Any advice for Diesel vehicles. 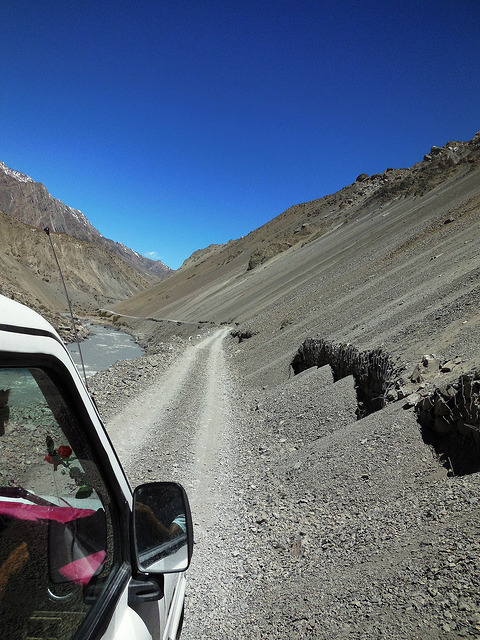 I plan to drive a Duster 4×4 diesel to Leh via kalpa-kaza this year in the month of August.